Habitat: Regenerating valley fen, formerly a raised bog where turf was cut. 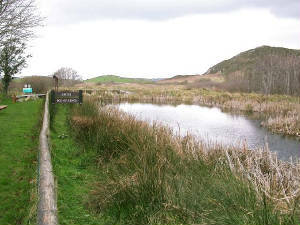 Owned by the Irish Peatland Conservation Council, in association with the Moin Fhionnurach Development Association, and designated as Waterford's first National Nature Reserve in 2004. Main interest: Typical birds of open country and bogland. Regular/annual: Breeding Snipe, Cuckoo, Stonechat, warblers, Reed Bunting; Long-eared & Barn Owls occur. Scarcer species & rarities: Short-eared Owl. Access: Fenor Bog is located 16 km south-southwest of Waterford City in the village of Fenor. It is just 5 km west of Tramore town: take a sharp right at Fenor village, on the Dungarvan coast-road, and site is on the left just beyond the church). 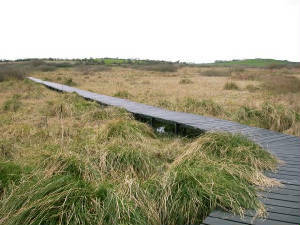 Good access to the habitat itself is provided by a constructed boardwalk.